How cool and how SIMPLE! Do we love it? YES! Make your favorite sugar cookie recipe. 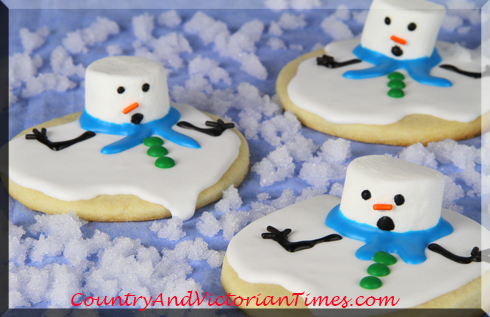 Make your favorite sugar cookie icing recipe when cookies are cooled and make a “puddle” that looks like the snowman has already melted. While the icing is still wet, stick a marshmallow to one side. Let icing dry. Use a red/orange candy sprinkle for the nose and black icing to make eyes, mouth and arms. Use blue icing for the scarf (or change this color up) and green for buttons (or change this color up as well). I told you it was simple – and it looks so cool you people will think you took a lot of time to create your masterpieces. This entry was posted in Recipes, ~Dessert, ~Holiday, ~Party, ~Snack and tagged Baking and Confections, cookie, cookies, cooking, guests, Holiday Cookies, Icing (food), man, men, snow, snowman, snowmen, Sugar cookie, ~Christmas, ~Home, ~Party. Bookmark the permalink.